Goodness me, it's hot! I know everybody is saying this but, you know, I'm British and all, so I must talk about the weather. My poor hair was lovingly straightened a couple of days ago, and now look at it. All puffed up and fluffy again! Luckily for me, I've just discovered the wonders of bodycon dresses. After shying away from them for years on account of my pot belly, I took the plunge with my Pride dress and I've never looked back. 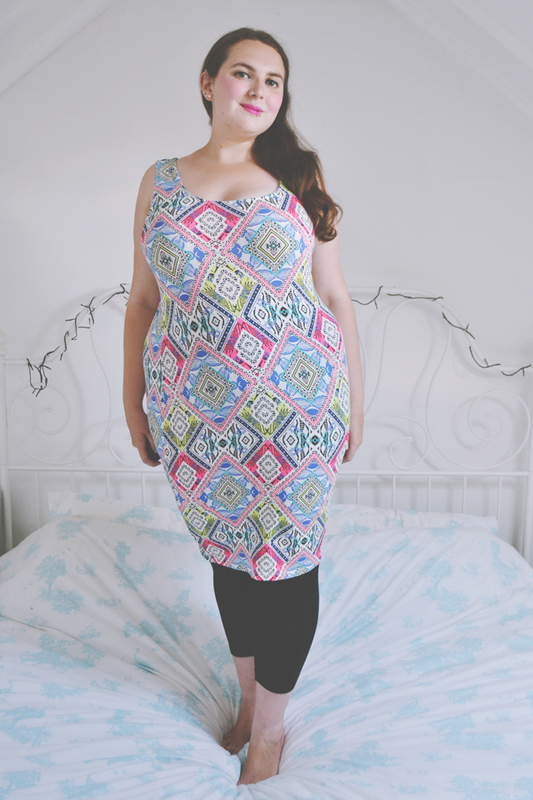 This Aztec-print bodycon dress from New Look is perfect for the sweltering weather we're having at the moment. It has a really comfortable stretch and the cotton stops me feeling sticky. And can we talk about how cute the print is? (By the way, it's currently in the sale!). I love the kaleidoscopic prints and colours in their Electric Feel collection right now: So bright and summery, and suitable for us plus-size girlies too. Hooray!